WITH John L. Sullivan the fourth period of fistic history comes to an end. His defeat of Kilrain, the last championship battle under the London prize ring rules, was the logical climax of pugilistic science as developed with those rules. The modern period of pugilism dates from the appearance of James J. Corbett, who under the Marquis of Queensberry rules, devised entirely new methods and principles for the sport Corbett stands as the first great master of the present 'school of boxing, corresponding in influence and importance with "Dan" Mendoza, who furnished traditions and formulas for the earlier school. Stepping aside from the course of the heavyweight championship, mention should be .made of one of the most remarkable battles in pugilistic annuls which intervenes, In point of time, between the Sullivan-Kilrain and Sullivan-Corbett fights. The meeting between "Jack" Dempsey and Robert Fitzsimmons first brought public attention to the man who afterward proved invincible until crushed by the biggest and, as held by some, the greatest heavyweight of them all. It is valuable as illustrating the early achievements of the conqueror of Corbett and the marvelous courage of a plucky little fighter who was matched far out of his class. UNREMITTING labor, twelve hours of It In the day, fashioned the gawky fighting machine that was Robert Fitzsimmons, gave him his massive knobs of muscle where he needed them and trained his spindly frame Into a tower of strength. The smithy was his first gymnasium and the hammer his apparatus. Born in Cornwall June 4,1862. he began to pound the anvil as soon as he could top it. Having emigrated to New Zealand, he made his first appearance in the ring at a tournament to determine the amateur title of the colony held at Timaru, In 1880, under the management of "Jem" Mace, the former world's champion. The incredulous spectators saw a tall, quiet man with a slight stoop, a homely, pleasant face of clerical cast and an altogether awkward and un businesslike makeup slide Into the fray and put away four men In succession apparently by sleight of hand. In the following year he entered again at the same place and polished off five contestants in a night, among them the Maori giant, Herbert Slade, the much vaunted (.opponent of John L Sullivan at a later date. The commonly accepted view at the time, and a view that persistently cropped up for years afterward in regard to Robert Fitzsimmons, was that his achievements stood for a mistake. Those little given to analysis preferred to wave him aside as the ephemeral product of favorable conditions and blind chance. It was natural that it should be so. Of all fighters who ever stood within the squared circle he was undoubtedly the least spectacular In the eyes of observers who did not understand how to appreciate his cunning and his consummate skill. He stepped a few paces with an opponent and lo, the man was out and none could tell the manner of it. Whereupon the undiscerning many cried upon luck while the wiser few spoke of masterly strategy and unequalled fighting equipment. To boxing followers schooled in admiration of the older type of pugilist Robert Fitzsimmons was no more the figure of a fighter than was David to the Philistines before he smote them. Tradition decreed that a boxer should be a stalwart, beefy, rock ribbed and builded specimen, with a pair of flailing fists and ''' unlimited capacity for bard knocks. The bigger and tougher and stronger he was by so much he approached the popular fancy more closely. Even shifty fighters were at least supposed to be constructed with some regard to symmetry . But what possible connection could exist between this thin, stooping, knock kneed Individual with his deprecating, good natured smile, shambling gait, top heavy Body and unimpressive pose, and the brawny hero of fistic art who crushed His adversaries in a whirlwind of ruthless fury. Clearly, none at all, and the world Of pugilism was slow to accept repeated proof that the slam bang operator had about as much Chance with the "Lanky Bob "as the thrashing oak with the electric fluid of the clouds. The methods of Fitsimmons,, at bottom were peculiarly his own. No other could Imitate them because no other who ever lived was built on quite the same architectural Lines. It was no infringement upon the fame of James J. Corbett to say that if that astute master had remained in the obscurity of peaceful pursuits Fitsimmons would have stood as the leader and innovator in Modern pugilism. As it happened Corbett exerted a dominant influence upon the Raw honed Cornishman. When Fitzsimmons fluttered the New Zealanders, and for some years afterward His style was crude and primitive compared with his later showing. Not until Corbett’s tactics had been developed and demonstrated did Fitsimmons , benefiting by The example, become the marvelous scientific genius of the ring. To emphasis the pugilistic abilities of Fitzsimmons had there growth, before all, In the man astonishing physical construction . If handsome is as handsome does He was a beauty , but only by wrench of metaphor. His build was planned distinctly for service, utilitarian to the last degree. There were his famous legs, crooked pipe stems in design. The good old athletic term of "manly grace" would have to suffer considerable stretching to include the lower limbs of Fitzsimmons. They were almost painfully thin and they splayed out from the knees like the props of a tripod. What nobody counted on, when he first appeared, those legs, with the generous allotment of feet made a perfect hitting foundation, bracing the body and. forming a firm base of operations. Above the waist .Fitzsimmons was the combination of the best points of twenty champions. His upper structure resembled nothing in the world so much as an ace of hearts, tapering to a waist that a cloak model might envy, and spreading Into a magnificent chest and massive shoulders, padded deep with muscle. The line of the shoulders ran smoothly into arms of phenomenal length and power. His neck was short, solid and strongly set, supporting a small head that could have withstood quite as much pounding as the smith's own: anvil. His height was five feet, eleven and a half, inches. In his early career he fought at about 150 pounds, later up to 170 though usually at 165. No other feature of his makeup so definitely marked the fighter as the arms. They were steel levers wrapped in layers of wire cord that showed in Bunched and rippled masses beneath the skin and holding within them A force which independently exerted meant a stiffer punch than an Ordinary boxer could produce with every ounce of him hurled into action. Much of the Cornishman’s prowess lay just here, before all else he was a jolter , and He jolted like a trip hammer. Every opponent who fel before him went down with a punch That traveled less than a foot. early observers of Fitzsimmons had great difficulty In discovering and identifying that swift almost invisible knockout shot which accounts For frequent confusion as to just how the result had been accomplished. Instead of packing It up, hauling away and launching a smash in time honored fashion, he sent over what Looked like a simple tap to those quick eyed to see it at all. Apparently he had made No effort. His adversary promptly collapsed and the watchers wondered .Meanwhile that tap Meant a blow thrice as dangerous as John L Sullivan’s most ponderous slogging swing. Fitzsimmons at his best was never brilliant save to the understanding of the initiated. While he was eminently a scientific boxer at the height of his career.his craft was not obvious to the general public. He was no show fighter. Graceful maneuvering, tripping steps, noble attitudes And harmony of motion were things of little moment in his scheme .just as Every unnecessary bit of weight was eliminated from his build where he could Spare it and added to the part where he could use it. To those familiar with his methods there was something wonderfully fascinating About Fitzsimmons in action. His weird." ungraceful gait, swift, sure, with a little noiseless shuffle; his half crouching almost lazy posture; his inimitable trickinsss; his short- dazzling feints: his terrific speed on offence; his skilful luring of the enemy into beating himself and his unsurpassed accuracy of aim and judgment made up a style that was almost uncanny in its baffling effectiveness. Representing In all his fighting characteristics the economy of efficiency, Fitzsimmons was one of the few men in the annals of pugilism who were unmistakably born to their calling. Such was his aptitude that if boxing had not been known in his day he must have invented it. The same simplicity and deadly directness that equipped him physically for the ring was carried out by his personal qualities. He was quite without fear. His Interests were few and simple He had a wholesome pride In his clean, sound body. Debauchery or excess of any kind never appealed to him. He was made for fighting and he knew it. After the preliminary triumphs is New Zealand Fitzsimmons next bobbed to the pugilistic surface In Australia, where he continued to advance steadily, If slowly, in fame and Importance He was not trumpeted, but by a gradual process of elimination be came' to the front. He won all his fights up to 1890 downing a dozen of the best men in his class., and the sporting public still doubting, still unwilling to admit that here was a really great boxer , grudgingly conceded him his place. His first defeat was at the hands of "Jim" Hall, a setback that he afterward reversed, and in the same year came to the united states. After winning from "Billy" McCarthy in San Francisco he knocked out Arthur Upham in New Orleans . 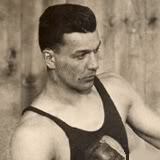 the last event made a great stir amongst American fight followers Who declared that here , at length , was a fitting opponent for "Jack" DempseyHolder of the middleweight title. Dempsey was the phenomenon of the time in pugilism.he had appeared in the ring At twenty one and had swept through the ranks of the lightweights and middleweights With meteoric brilliance and astounding success.in 1884 he had beaten George Fulljames For the lightweight championship of America . unable to find material for further conquests at his usual weight of 135 pounds he went after the next division climbing swiftly to the top. It was nothing for him to take on three fights within a week. "The Nonpareil" was one of the nerviest, most courageous and startling figures in fistic history. he was regarded by many as a second "Tom" Sayers. It was predicted for him that, like the lightweight English marvel who upset Precedents and wrested heavyweight honors from the best of his Contemporaries. Dempsey would capture everything In sight. For several years he dogged Charlie Mitchell with challenges, and made that artful dodgers life something of a burden to him in finding excuses. Disappointed here, Dempsey did not consider John L. Sullivan beyond the clutch of his ambition and there was considerable talk of a match between them: When Fitzsimmon’s loomed up as a possibility through his defeat of Upham "The Nonpareil Jumped at the opportunity to meet the Cornishman. Dempsey was a rough, and ready fighter of great natural hardihood and unlimited pluck. In science he was as good as the general run of the day, but he depended for success upon his endurance and plain "scrapping" abilities. He bad been trained, like Sullivan, as a bare knuckle boxer and he never took kindly to the padded gloves. Fitzsimmons was only too ready to meet an opponent of this kind, one whose defeat would mean enormous prestige owing to his great reputation, and -whose calibre, as the invader conceived, was small for the mighty noise he had made. The fight was obtained by the Olympic Club of New Orleans which offered a $12,000 purse, $11,000 to the winner and $1,000 to the loser.the men to weigh no more than 154 pounds at the ringside five minutes before the call of time.five ounce gloves were to be used, Marquis of Queensberry rules to be followed. On the evening of January 14, 1891, some four thousand persons were packed in the amphitheatre of the Olympic Club, seated on four sides of the twenty-four foot ring, which was protected by a barbed wire fence from impromptu Interruptions and further guarded by a squad of police. The ring Itself was furnished with padded posts and a floor of packed sand. The gathering Included most of the prominent sporting men of the country and in the crowd were many well known members of the profession, Including "Tom" Allen, former champion; "Jake" Kilrain. "Mike" Cleary and Corbett. The Contest Committee of the club had chosen Colonel Alex Brewster for referee and Toby Duffy was timekeeper. ust after nine o'clock Fitzsimmons appeared In the Hall with Carroll and O'Connell. his seconds and Robinson, his bottle holder. At stripping he stood in garnet trunks supported by a white sash and black fighting shoes.Dempsey followed him, in black tights, with a red belt and white shoes, and the crowd gave them an indiscriminate and hearty welcome.At weighing in the Cornishman tipped the beam at 150 ½ pounds, and the "Nonpareil" at 144 pounds. There had been much dispute about Dempsey’s weight and an unofficial report was sent out that he weighed 150 pounds. Four days before the battle he weighed 137 pounds and the seven ponds he took on before entering the ring did him little good. On entering the ring the men looked each other over with appraising glances for some minutes and then Fitzsimmons crossing to his adversary’s corner offered his hand. Dempsey wrung warmly, while the crowd cheered the incident as a promise of clean sport and manly forbearance between the two.As they stood together the disparity in height was made evident.Dempsey being no more than 5ft 8 ½ to the others scant 6ft .Fitzsimmons won the choice of corners and of gloves.At half past nine o’clock the bell sounded for the first round. They advanced to the center for the handclasp and stood on guard an instant, when Fitzsimmons moving quickly on his feet led lightly with the right, brushing Dempsey's jaw and getting away. Dempsey hopped from side to side, loosened up with a few light ones, and suddenly threw himself Into an impetuous rush, slugging right and left as he came. The wary Cornishman shuffled away before the attack, covering himself perfectly and blocking every swing while giving ground. Dempsey, apparently bent upon instant results forced his man to the ropesand came at him with a dash and vim that brought roars of applause from his friends in the house. The little fellow cut loose with a rattling succession of drives and swings, keying up the pace. The rally was watched with the tensest Interest and was considered a fair test of the almost unknown visitors ability Dempsey's attack was characteristic. By this means he was accustomed to take the upper hand from the start, bewilder his man with a dazzling display of speed and strike a winning stride. But something seemed to have gone wrong with The "Nonpareil's" calculations. The tall, gaunt Cornishman had retreated according to specification only to come to a stand and resolve himself into a stone wall of defence. Dempsev pounded at him repeatedly with his right but the blows slid from the other's guard and suddenly Fitzsimmons, with a lightning shift of tactics went upon the offensive himself. The swift sparring that followed kept the house in ecstatics. with ever increasing force and confidence as he measured the strong and weak joints of his man. always the first care of a methodical strategist. Fitzsimmons tapped and swung and drove in a burst of aggression that overlapped Dempsey’s own. The champion in his turn gave before it reluctantly and they moved slowly about the ring in a whirl of fists until the tap of the gong. Fitzsimmons glided out of his corner at the signal for the second round and went after Dempsey In his own corner feinting right and left and tapping right. The Nonpareil ducked and forced in with a ripping right smash to the face.Having begun so well he came on in a rush to be met with a snapping jolt to the body that threw him back on the defensive. By another of his smooth effortless transitions the Cornishman went hard upon the aggressive once more, working right and left rapidly and shifting ground frequently whenever Dempsey sought to make a stand or rush in. He got some bruising clips to the ribs but while pressing on after Dempsey around the ring he gave the champion another opportunity. Dempsey sprang in with his straight drive to the face, landing prettily, but he was slow at recovery and Fitzsimmons countered hard to the neck, this simple, battering facer proved to be Dempsey’s one effective bit of artillery, such as it was, against his adversary's clever blocking and confusing play. Fitzsimmons began now to force the pace consistently driving the champion away time and again with long distance jabs and thrusts. This was particularly galling to Dempsey, who was accustomed to give ground to no man. But try as he might he could not get past that terrible reach or find a point in that muscle-corded armor where he seemed to make the slightest impression. Worried out of his corner around into that of his opponent, he made a desperate stand and slammed back viciously. Fitzsimmons, always cool, always smiling, met every delivery with wisy moves of his long arms and bored in persistently, landing at intervals a lightning jolt that sent Dempsey once more upon his retreat Just before the bell the Cornishman whipped over another stinger to the neck It was Fitzsimmons' round all the way. If the Inevitable was not yet generally recognized It was at least evident that Dempsey had a most serious problem on his hands. He had made absolutely no impression upon his ungainly opponent thus far and his supporters looked to see him start something in the third round. Fitzsimmons was after him promptly and when the champion, rushing, refused to be beaten back, they clinched in Dempsey's corner. At the breakaway Dempsey ran blindly into one of the padded posts. Fitzsimmons was after him In a flash achieved his bewilderment with rapid feints and taps, and, suddenly lashing out with a snappy hook with the right to the point of the jaw, lifted the little chap clear of the floor and sent him down. The crowd yelled In astonishment. No one in the ring had ever been credited with the ability to handle "The Nonpareil" in such a manner. Dempsey was up quickly, but the Cornishman gave him no opportunity to recover. He was no more than on his feet when the cyclone burst upon him. Fitzsimmons let out the top notch of his speed and was all over his man in an Instant, smashing repeatedly to neck face and jaw.Dempsey had no chance ever to attempt a return. 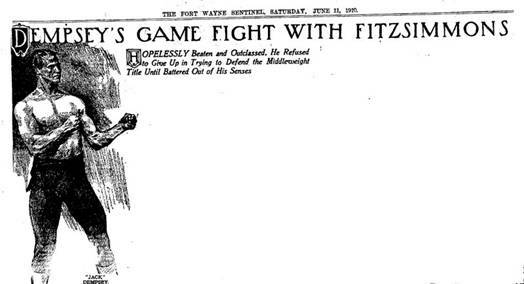 He backed away, arms crossed before his face, and attempted in vain to save himself in a clinch as Fitz rained blows at will until the bell checked the bout. The champion irritated beyond all measure by the complete failure Of his tactics tried hard to take the lead in the fourth round and swung viciously. Fitzsimmons seemed to fade away around the blow and in the next wink was pounding Dempsey’s jaw. The champion was driven back into his own corner, where he rallied and as the Cornishman came on jammed through left And right to the face. Fitzsimons returned the compliment instantly with a hard jolt To the neck and let himself out with a volley on the head and face .Dempsey could make no stand against the blinding delivery and backed away. Fitzsimmons was hot on the trail and the puzzled spectators saw the fight degenerate into a running race, the Cornishman apparently landing at will and Dempsey unable to make a return. Dempsey tried to check in Fitzsimmons corner and in the rally The Cornishman’s right forearm levered up with a smash to the mouth that covered the champion with crimson.at the gong demsey was being driven all over the ring. In the fifth round Fitzsimmons led for the body and followed. Dempsey to the ropes where he hooked heavily to the jaw and mouth. The Nonpareil made a desperate stand and In a terrific spurt had a shade the best of it getting sharply to the neck. But such form was nothing more than a flash Dempsey and the calm, implacable Cornishman pressing him again the next minute. In a fierce rally Fitzsimmons landed his famous Body blow just above the heart. It was a short arm jolt landed with crushing force And Dempsey reeled stumbled into a clinch and slipped to the ground. He was up again with an effort and managed to stand his adversary off until the gong. Dempsey once again attempted to stem the tide at the opening of the sixth round but was met with a hard facer. sharp in fighting followed Fitzsimmons having the Best of the exchanges .then Dempsey hopped away, jumped in with one of his one effective maneuver throughout the fight feinting he rammed twice to the neck with his right hand And came on with a magnificent left drive that caught Fitz fairly on the throat .The tall fellow taken by surprise seemed all abroad for an instant and it looked as if Dempsey was about to come into his ownat last. But the check was brief, before Dempsey could take the advantage Fitzsimmons was in the fray more fiercely than ever, out boxing Dempsey at every move and snapping up his terrific jolt over the heart at the bell. At the call of time Fitzsimmons was fresh and without a scratch, while Dempsey showed crimson about his mouth and bruises on his left Jaw. The Cornishman opened the seventh round which was to prove the definite turning point, If such a one sided affair could be said to have a turning with a light lead to the stomach. Dempsey swept through an opening with two rapid clips to the ribs and shot over a neat facer. The last blow ruffled Fitzsimmons somewhat and he launched into his fastest pace, beating Dempsey back to the ropes and landing a hail of blows to the face and neck. Dempsey was hopelessly out of it and tried to throw himself into a clinch. The Cornishman drove him away, but he came back and managed to hang on. At the break he clinched again and repeated the operation successfully several times. Fitzsimmons wriggled away from his man, whipped through a wicked uppercut that sent Dempsey down at the ropes. When the Nonpareil staggered up again and rushed, Fitzsimmons met him with hooks and short swings all over the face, and at the bell the champion was covered in crimson. From this point the feature of the battle was the unprecedented display of dogged courage on the part of Dempsey. Having made almost no showing on offence, he was now to play the beaten But indomitable fighter in a way that has made his name synonymous with pluckiness. Fitzsimmons went.to his corner at the opening of the eighth round and they milled, but Dempsey was too weak to inflict any damage. The Cornishman peppered him at will, finally swinging right to the neck and following with a left uppercut that Dempsey helpless and weaving against the ropes. At the end of the round the champion was being, fought all around the ring, badly bruised and wounded. In the ninth round Dempsey tried desperately and repeatedly for the neck, but could not land and was met with a series of smashes to the mouth "The Nonpareil" took to hanging on to avoid punishment until Fitzsimmons, pushing him away, ripped his face. Dempsey clinched again and again and managed to get through the round without much punishment, though unable to deliver returns. Fitzsimmons went after his man In the tenth round as if to make an end, leading to the neck. Dempsey tried to clinch and the tan fellow fought him away with a heavy right hook to the Jaw. The champion was able to stagger into a clinch and on the break was harried all around the ring, until a flashing uppercut to the Jaw sent him to his knees. On rising Dempsey was plainly helpless. Fitzsimmons forced him and shot another uppercut to the jaw just as Dempsey was falling into a clinch. Dempsey slipped to the floor, dragging Fitzsimmons with him. When they joined again the Cornishman could do just about what he pleased and floored Dempsey with a third uppercut. The bell saved "The Nonpareil." Dempsey's friends were now anxious that he should quit, and Fitzsimmons, whose disposition was always mild and free from cruelty, was quite willing to spare the game little fellow. But the champion would not hear of such a thing and the crowd cheered him to the echo As he prepared to continue.Some of the Dempsey cheering veered to the Cornishman at this point, As well it might, for the tall fighter showed the utmost forbearance and sportsmanship. By belligerent method he could have put Dempsey out anywhere after the ninth round, but he contented himself with Sending his opponent down and urging him to give up.Early in the eleventh round he sent Dempsey through the ropes. The champion got up and Fitzsimmons put him down again. "Stay there Jack, your beat" said the Cornishman. "Dammed if I am.You’ve got to knock me out" said Dempsey and scrambled up, only to fall before an uppercut and another. The Nonpareil was in fearful shape, drenched in crimson, cut and slashed and half blinded. But he got to his feet once more and once more Fitzsimmons landed a stinging uppercut to the point of the jaw .Dempsey fell with his head on the lower rope, and again Fitzsimmons urged him to stay there, and again he got doggedly to his feet. The gong intervened and Dempsey was carried to his corner by his attendants. The twelfth round was simply a further display of Dempsey's bulldog grit. Fitzsimmons went to his corner and put him down four times with right uppercuts. "The Nonpareil" scarcely even made a pretence of raising his hands. But he would not give up The last knockdown looked like a settler and Fitzsimmons walked away from him to his own corner watching the cheering crowd curiously. Suddenly a shout brought him around In surprise and there was Dempsey, staggering blindly across the ring at him. The bell prevented more trouble for the little man. In the thirteenth round Dempsey, dazed, helpless, Fitzsimmons walked up to him and Dempsey tried to guard his neck and face, wincing In spite of his nerve Fitzsimmons tapped him twice to the mouth and sent him reeling to the ropes with a jolt to the ribs. As he leaned, panting, the Cornishman hit him on the jaw and he went down, full length. lying there, exhausted, covered with crimson and smeared with the dust of battle, the brave little gladiator raised himself painfully on hip and hand, but sank again. Twice he tried to lift himself and twice he sank. Then he covered his face with his hands and the watchers knew that the battle was over because he could not summon the strength to stand. Fitzsimmons, receiving the plaudits of the crowd, was without a mark upon him. He and Dempsey were the best of friends until the untimely death of the Nonpareil in 1894.